Home > Christmas Day Food > Which Turkey to Order? Choosing a turkey can be a confusing business, but with a little background know-how, you should be well on your way to selecting a fine specimen this Christmas. The turkey was introduced to England from America back in the 16th century, although it remained too expensive for most people to enjoy. For centuries the traditional Christmas meal was not centred on turkey but on boar, goose or beef – but by the end of the 1800’s, they gained in popularity with Norfolk turkey farmers doing good trade. Turkeys are seasonal fowl and around October, farmers would attach leather to their feet for protection and lead them on the long walk from Norfolk to London ready to rest and be fattened up for market. At that time, they all had black feathers, but because when plucked, small black marks are left, there was a call to produce a white-feathered bird – and hence our most commonly known turkey was born. These days, with the introduction of intensive rearing and factory farming, turkeys are available the whole year round and no longer just at Christmas. This has enabled prices to fall and for turkey to be a low-cost, high protein, lean meat which all can enjoy. Despite being cheap and plentiful, along with ‘factory’ birds, came less flavour, dry flesh and a completely bland taste – a reputation which has done no favours for the turkey in recent years. Gradually, though, amongst discerning cooks and those who enjoy good food, has been a move to re-claim the turkey as a delicious lean meat with a delicately gamey flavour. This can be achieved by being selective when choosing your turkey. Try to avoid the frozen supermarket turkeys if you can, for although they can be kept frozen for up to six months, they do tend to lose their flavour over time. Also, avoid any pre-packed turkeys that state water has been added. 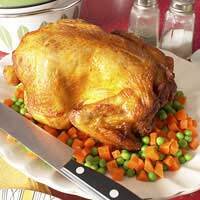 This is often done to plump up the breast of the bird and help keep the meat moist but does absolutely nothing for the flavour. Go for fresh instead. Factory farmed turkeys are by far the cheapest on the market and if your budget is very restricted, they do offer the most meat for your money – but ask yourself at what cost. These turkeys do not have a good flavour as they have been forcibly reared so fast that their muscle tissue has not had a chance to develop. They are kept in cramped, windowless barns in largely unacceptable conditions, pumped with growth hormones and antibiotics to keep disease at bay and brought to slaughter in less than ten weeks. They also tend to be dipped in water prior to plucking, to soften the skin, and this further reduces the end taste. If you can, always opt for a free-range turkey as opposed to an intensively reared one. They will have been given a much longer period in which to mature naturally and space to move around in natural light – all of which helps to develop good, dense flesh and a more succulent flavour. They are also more humanely slaughtered. Organic turkeys are similar to free-range in that they are allowed to roam freely and behave naturally, but it also means that they are not treated with any antibiotics or hormones and fed only on non-GM, organic produce.. If a turkey is labelled ‘Farm Fresh’ it means that it has been hung for a few days post slaughter to allow the flavours to develop, and then dry-plucked, rather than having been dipped in water as with battery birds. In recent years, black and bronze turkeys are again being bred by specialist turkey farmers. Which colour you opt for is a matter of personal choice but the black and bronze varieties tend to have a more intense flavour and a slightly juicier, darker meat, whereas the white birds have a more delicate flavour and the flesh is lighter in colour. Norfolk Black, Kelly Bronze, Cambridge Bronze and Traditional White are all good breeds to go for. Forget the cut-price supermarket isles and instead head to your local butcher. They should be able to tell you where all their turkeys come from and how they have been farmed and treated. Alternatively, locate a turkey farmer near you and buy from them direct. If this is tricky, there are many farms now offering online delivery services direct to your door. In summary, your Christmas turkey will taste as good as its provenance. In other words, if you can afford to, it is worth spending a little bit extra on getting a good one!